The AT-ST (All Terrain-Scout Transport) was colloquially known as a "chicken walker" because of its shape and walking motion, the AT-ST was a light, heavily-armed, ground combat vehicle, and able to trek various environments. The stock model was equipped with a medium, chin-mounted, double blaster cannon, a blaster cannon on the port side, a concussion grenade launcher on the starboard side of its head, two clawed feet, and was encased with 9095-T8511 grade durasteel. 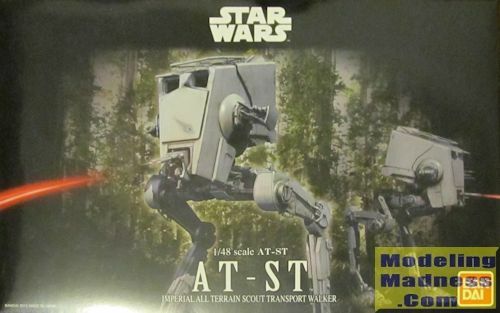 The AT-ST was designed to be a recon, hit-and-run vehicle. It was lighter than its bigger brother, the AT-AT, and could withstand standard blaster fire, but was vulnerable to heavy laser fire and missiles, as well as physical attacks to the legs and the side of the head. The latter weakness was witnessed during the Battle of Endor, when the Ewok tribal warriors destroyed an AT-ST by using logs to ram the sides of the walker's head. The AT-ST could also be infiltrated by species with great physical strength. At Endor, the Wookiee, Chewbacca, forced his way through the top hatch and took control of the walker in this manner. The AT-ST's chin blasters had an effective range of two kilometers and were used for anti-vehicle attacks, while the armor-shielded blaster cannon and grenade launcher provided close-range protection against infantry and light emplacements. Like the AT-AT, the AT-ST utilized a holographic targeting system, allowing a 360-degree view of its position. The armor was not sufficient to withstand blasts from starship cannons, but was impervious to small-arms fire. The 8.6-meter-tall walkers were piloted by a crew of two Imperial Army pilots and carried 200 kilograms of cargo. The bipedal propulsion system was one of the primary weaknesses of the AT-ST. On even terrain, the walker could achieve over 90 kilometers per hour, but on uneven or shifting terrain, a walker could quickly become unbalanced enough to fall over. An advanced gyro system, located beneath the command module, provided the balance needed, but could be easily damaged. Following the Battle of Hoth, Rebel tacticians learned to ambush and immobilize AT-ST's; once trapped, a well-placed rifle shot could destroy the walker's gyro system. Unless you happen to live in Asia, you may have a hard time getting one because the legal rights holders (Disney aka the Mouse aka The Empire) has put a stop to 3rd party resellers like Hobby Link Japan selling Bandai kits outside of the licensing agreement zone as of Sept 2015. The parts are very well done with little or no flash. The detail is amazingly done on all parts including both sides of the interior components and the blaster cannon barrels are hollow (showing off the slide molding used.) I have never had a kit floor me with all the detail here. My understanding is that this is what Bandai does well, but I’ve never made any of their Gundam kits so this is all new to me. From the looks of the parts, you don’t need to glue much but from what I’ve read you have to be careful attaching as the parts are so tight that sometimes they will break from the stress. I personally think the red clear lasers pieces are useless, but that’s just my opinion and others will probably think it is really cool and I should just shut my mouth. The kit comes with markings consisting of waterslide decals (for advanced modelers) and stickers (for kids or adults who can’t be bothered.) Your choice of what to use. The instruction booklet is in Japanese (not surprising as this kit is strictly for the Japanese/Asian market.) 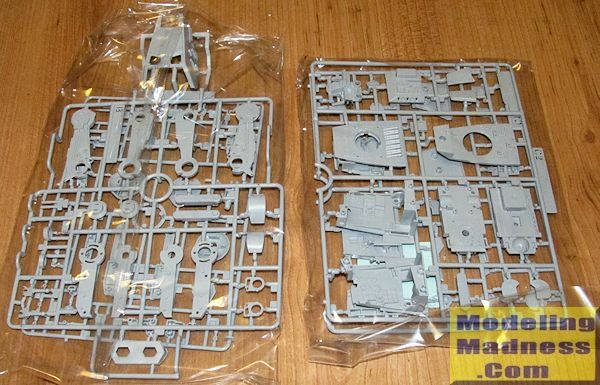 However, the color scheme is not complicated so it will not be hard to paint. An amazing kit. It is a damn shame that a kit like this will not be available through regular distribution channels to Star Wars fans in North America. If you can get your hands on one you will not be disappointed. It seems you might need to find a smuggler captain whose freighter can make the Japan run in 12 parsecs and has secret compartments to smuggle them back to North America.